"This was a terrible tragedy, but sometimes these things just happen and there's nothing anyone can do to stop them," said North Carolina resident Samuel Wipper, echoing sentiments expressed by tens of millions of individuals who reside in a nation where over half of the world's deadliest mass shootings have occurred in the past 50 years and whose citizens are 20 times more likely to die of gun violence than those of other developed nations. "It's a shame, but what can we do? There really wasn't anything that was going to keep this guy from snapping and killing a lot of people if that's what he really wanted." 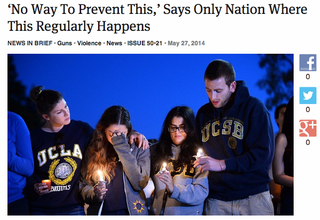 At press time, residents of the only economically advanced nation in the world where roughly two mass shootings have occurred every month for the past five years were referring to themselves and their situation as "helpless." Good luck deciding whether to laugh or cry.